News provided by LG Electronics Inc.
SEOUL--(Korea Newswire) April 06, 2017 -- Following the initial rollout in its home country of South Korea, LG Electronics (LG) announced the commencement of shipment of its highly praised LG G6 smartphone to international markets this week, including key countries in North America, Asia, Europe, Central and South Americas over the course of the next several weeks. Nearly 200 carriers and operators worldwide will be making the LG G6 available to their local customers. The LG G6 received many positive reactions at Mobile World Congress 2017 earlier this year, winning an unprecedented 36 awards from various industry publications. With a design based on delivering what everyday consumers wanted from their smartphones, the G6 features an unprecedented 5.7-inch display in a compact 5.2-inch body with minimal bezels for convenient one-handed operation without sacrificing screen real estate. With an immersive FullVision display that supports both Dolby Vision and HDR 10, the LG G6 is compatible with more HDR content than any smartphone currently available. 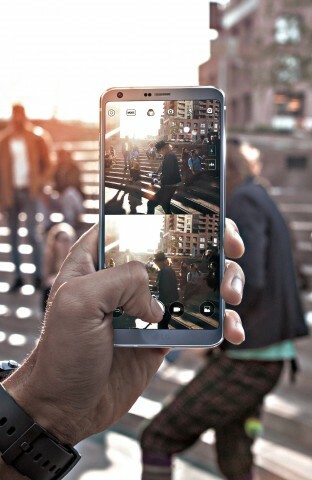 And the unique 18:9 screen aspect ratio of the FullVision display allows the screen to be divided into two identical perfect squares, ideal for multi-tasking with the G6’s camera UX, which was developed with social media users in mind. For many customers, LG’s reputation and heritage of excellence in smartphone photography is what separates its phones from the competition. LG takes photography to the next level once again with a wide angle front-facing camera to complement the wide angle dual camera setup on the rear. The 125-degree lens on the back delivers crisp, panoramic image with less edge distortion than before and switching between the wide and standard lenses is smooth and seamless. And the 5MP 100-degree field of view front camera allows for large group shots without the need to tote around a cumbersome selfie stick. Sculpted from a blend of high quality metal and smooth glass, the LG G6 is a minimalist’s dream. But the aesthetic beauty doesn’t sacrifice durability, as the phone’s rounded edges provide optimal impact resistance. Protection from the elements is guaranteed as the LG G6 meets the IP68 standard for water and dust resistance. And with Google Assistant available right out of the box, useful information is never far away. Moreover, the LG G6 has the distinction of having met and passed the MIL-STD 810G standard for durability, conducted by independent testing and certification firm MET (Maryland Electrical Testing) Laboratories. The G6 passed the following 14 tests, the most categories among smartphones tested: Low Temperature, High Temperature, Humidity, Vibration, Solar Radiation, Low Pressure, Sand and Dust, Immersion, Temperature Shock, Salt Fog and Rain. Tough enough to be carried on actual military drills and missions, customers of the LG G6 have one less thing they need to worry about. Prices and exact dates of availability will be announced locally in each market at the time of launch. All releases from LG Electronics Inc.